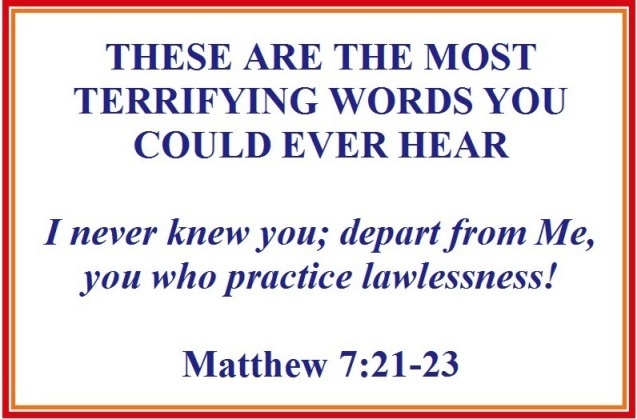 The most terrifying words a professing Christian could ever hear would be Jesus saying, “I never knew you; depart from Me, you workers of lawlessness” (Matthew 7:21-23). The Lord Jesus will declare those horrifying words to many, not a few, who boast in the many works they did in His Name. They called Him Lord but did not obey His first command to “repent and believe the Gospel” (Mark 1:15). Who are the “many” who will be turned away on Judgment Day? They are those who thought they could gain eternal life by the works they were doing instead of trusting in the work Christ had done. They also never turned from their sin to follow Jesus Christ in faith. Since they never obeyed the Gospel of Christ, they will pay the penalty of eternal destruction, away from the presence of the Lord (2 Thessalonians 1:9). Tragically, when Jesus declares to them, “depart from Me,” there will be no second chance, no excuses, and no blaming the false teachers who deceived them. The Lord Jesus also referred to the “many” when He spoke of the two paths to eternity. Many will travel the broad road to destruction instead of the narrow road to eternal life (Matthew 7:13-14). Rather than striving to enter the narrow gate by testing every man’s teaching, they foolishly follow false teachers, who are wolves disguised in sheep’s clothing (Matthew 7:15). It is sad to see that many profess faith in Christ, but only a few show evidence of being born again as new creatures in Christ. Many calling themselves Christians cannot even communicate the Gospel that has the power to save souls. Part of the blame must be placed on man-centered methods of evangelism such as making a decision to “accept” Christ by repeating a prayer, or walking forward to gain salvation, or being a “good person” and doing good works. None of these methods are found in the Bible. The only saving response to the Gospel of Grace is to repent and believe on the Lord Jesus Christ (Mark 1:15). Part of the blame can also be placed on those who compromise the Gospel to make it more palatable and less offensive (Galatians 1:6-10). 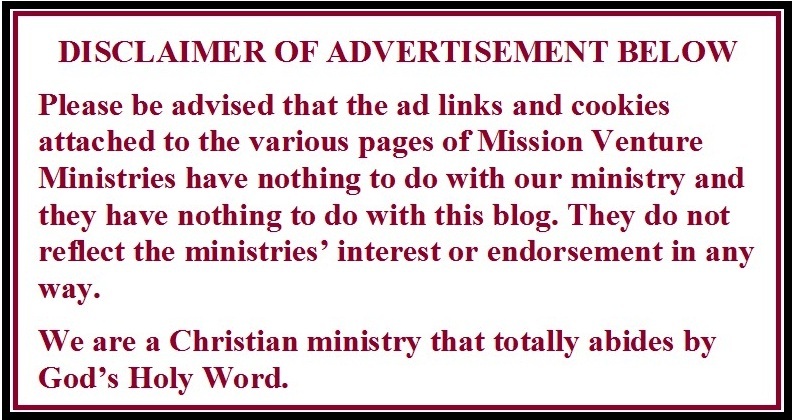 With so many false converts, the church has become a mission field. Many who profess Christ are not really obedient to Christ! They do not understand the new birth. They have never passed from death unto life. They remain condemned because they have not been justified. They remain enemies of God even though they profess to be His friends! They remain enslaved to sin because they have never been set free. They profess the Savior with words, but their heart is far from Him (Matthew 15:8). They deceive other people with their external righteousness, but they cannot deceive God because God cannot be mocked (Galatians 6:7). They are unaware of their pending danger, because they have never examined themselves to see if their faith is genuine: “Examine yourselves as to whether you are in the faith. Test yourselves. Do you not know yourselves, that Jesus Christ is in you?—unless indeed you are disqualified” (2 Corinthians 13:5). You think you are a good person, when the Word says: “There is none who does good, no, not one” (Romans 3:12). You have knowledge of God but you do not obey Him. “They profess to know God, but in works they deny Him, being abominable, disobedient, and disqualified for every good work” (Titus 1:16). You do not pursue sanctification when the Bible says: “Pursue peace with all people, and holiness, without which no one will see the Lord” (Hebrews 12:14). You are self-righteous without repentance (Luke 18:9-14). You seek to establish your own righteousness. “For they being ignorant of God’s righteousness, and seeking to establish their own righteousness, have not submitted to the righteousness of God” (Romans 10:3). You are unwilling to forgive others. “But if you do not forgive men their trespasses, neither will your Father forgive your trespasses” (Matthew 6:15). You have no desire to follow Jesus, when Jesus said: “If anyone desires to come after Me, let him deny himself, and take up his cross daily, and follow Me” (Luke 9:23). You call Jesus ‘Lord’ but do not do what He says (Luke 6:46). You love your sin. “And this is the condemnation, that the light has come into the world, and men loved darkness rather than light, because their deeds were evil” (John 3:19). You have not departed from iniquity. “Let everyone who names the name of Christ depart from iniquity” (2 Timothy 2:19). You condone or promote things God hates (Proverbs 6:16-19). You are a mere hearer of the Word, not a doer, thereby deceiving yourself (James 1:22). You are full of pride with no humility (James 4:6). You walk in darkness. “If we say that we have fellowship with Him, and walk in darkness, we lie and do not practice the truth” (1 John 1:6). You live according to your sinful nature (Romans 8:5). You do not love the truth…“that they all may be condemned who did not believe the truth but had pleasure in unrighteousness” (2 Thessalonians 2:10-12). You say that Jesus is your Savior but you do not make Him the Lord of your life (Luke 4:46). Abide in God’s Word – then you will know the truth that will set you free from religious deception (John 8:31-32). Repent – with godly sorrow for your sins and cry out to God for mercy (Luke 18:13). “For godly sorrow produces repentance leading to salvation, not to be regretted; but the sorrow of the world produces death” (2 Corinthians 7:10). Believe the Gospel – follow the Lord Jesus Christ in faith (Romans 10:9-10). Love God – with all you heart, soul and mind (Matthew 22:37). “If anyone does not love the Lord Jesus Christ, let him be accursed” (1 Corinthians 16:22). What should we do if we know someone who may be a false convert? Ask them to share the events that were present during their conversion. If their conversion testimony does not line up with Scripture, ask them more questions. Speak the truth in love. Let them know eternity is forever! We can be wrong about a lot of things in this life and still survive, but if we are wrong about our faith, we will pay for that mistake for all eternity. At this time, there are images of the raging fires that are scorching many parts of the world that are absolutely terrifying. Thousands of people are fleeing to a safe place because they sense the imminent danger. As heartbreaking as it is to see these devastating fires, how much more disheartening is it to see people dismiss the reality of the horrifying fire that awaits people who die without Christ. Those who die in their sins will go immediately to a place of torments where they consciously experience pain and thirst from a blazing fire that will never be extinguished. The horror and hopelessness is so great they will want to warn their loved ones. Please read the parable that Jesus told His disciples about LAZARUS AND THE RICH MAN; where Jesus warns us that the eternal state of punishment for sins is irreversible; there is no second chance and no escape. Now, since we know the fear of the Lord, we need to persuade men (2 Corinthians 5:11) and plead with those we see that are lost to flee to the loving and merciful arms of Jesus Christ who is their only hope of escape (Luke 16:19-31). Please know that “Salvation is found in no one else, for there is no other name under heaven given to mankind by which we must be saved” (Acts 4:12). As priests unto God, which all true born again believers are (Revelation 1:6) let us do all we can to rescue our loved ones from God’s wrath, before it is too late!